From middle-class cottages to Gilded Age mansions, House Proud: A Social History of Atlanta Interiors, 1880-1919 presents a view of Atlanta, reflected through the city’s most highly prized resource, its homes. Richly illustrated with archival photographs and annotated with historical commentary, House Proud traces Atlanta’s response to national trends in interiors and furnishings. 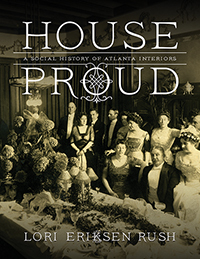 It also identifies the tastemakers—those architects and interior decorators who helped craft Atlanta’s image as a “City of Beautiful Homes.” The interiors presented in House Proud tell the story of Atlanta and its people during the dynamic decades of 1880–1919, when the city emerged from reconstruction and entered a period of notable expansion and economic progress. Images and textural commentary illustrate how the homes came to embody the aspirations of both the New South and the New Rich. Seen as proof of Atlanta’s post-war progress and artistic sophistication, homes were fundamental to the city’s ongoing efforts to promote itself and reconcile its regional past with its hopes for the future. Our homes and possessions provide vital clues about who we are and what we value. They reflect our sense of beauty and level of cultural sophistication, and may also reveal a social and cultural insecurity of which, perhaps, we ourselves are unaware. Though told within the context of the Victorian era, this story of the Atlanta home has a message that transcends its historical period. It suggests as well timeless truths about home that may help us to understand ourselves and the lives we live today. Rush (formerly, The Art Institute of Atlanta) brings her years of experience with teaching the history of interiors and furniture to this attractive new contribution to the study of American domestic design. Her focus here is on post–Civil War interiors in Atlanta, as that burgeoning city became emblematic of the New South. She discovers, perhaps not surprisingly, that Atlanta interiors, like other cultural entities in the South, sometimes bore considerable similarity to those in the North and sometimes did not. Rush is a capable guide to reading domestic interiors and to the complex, sometimes conflicted culture of postwar Atlanta, with its strong sense of tradition and place. She traces four decades of nationwide fashions in furnishing and Atlanta’s varying responses to them. She also discusses the antiques dealers, decorators, architects, and retailers who supplied furnishings and decorating expertise. A particularly useful chapter explores the emergence of the professional interior decorator and the rise of women within that field. Rush’s graceful text is supported by nearly 100 images; most are crisply reproduced period photographs of documented Atlanta interiors. This significant regional study will be useful for library collections on the history of US interior design and/or material culture of the American South. Summing Up: Recommended. Lower-division undergraduates and above; general readers.